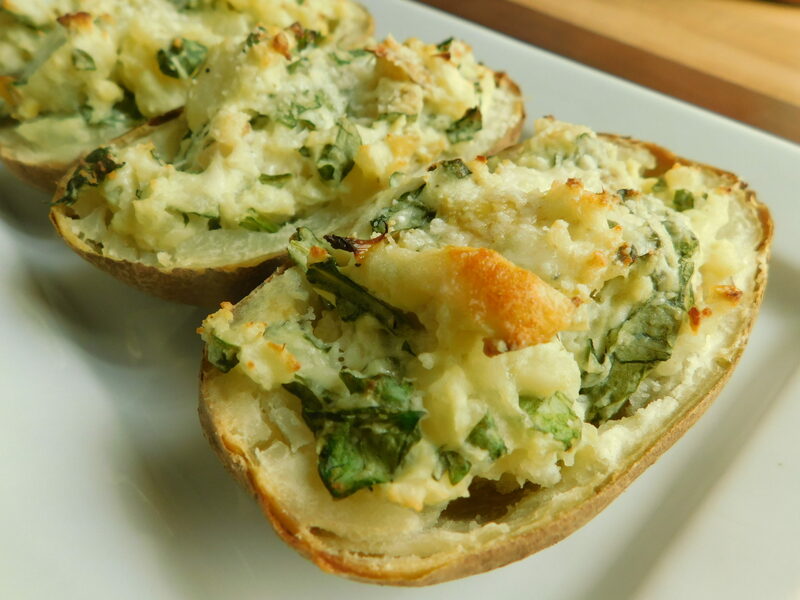 I’m not much of a spinach fan but… if you throw that sucker in a creamy dip I’ll eat it all day long 😉 and that was my inspiration for these delicious spinach & artichoke stuffed potatoes. 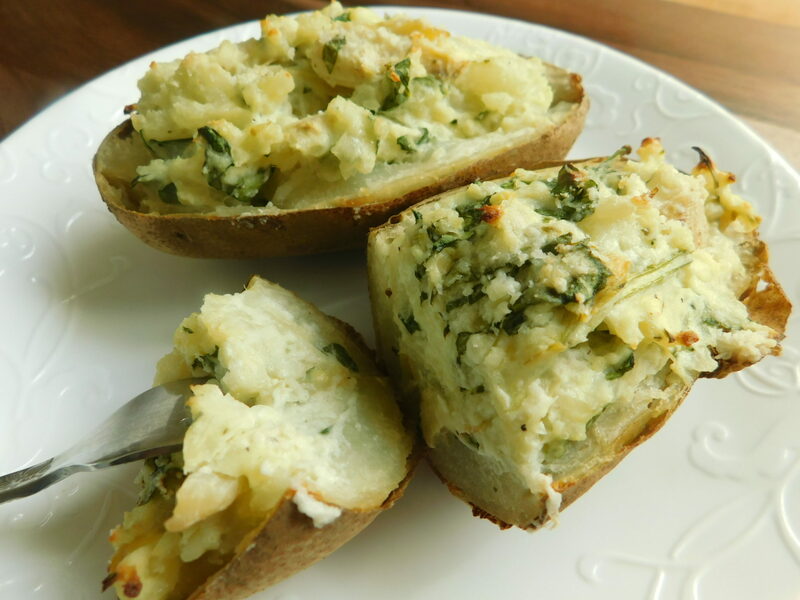 I was enjoying some dip one evening and thought this would be so good on top of a baked potato so voila.. here you have it and the end result was so good! 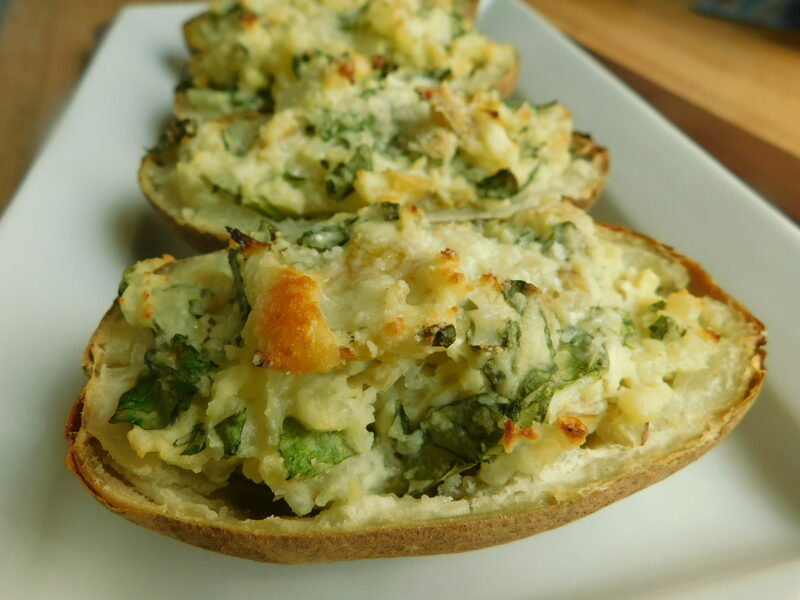 Makes 8 stuffed potatoes at just 4 freestyle smart points each and 132 calories. 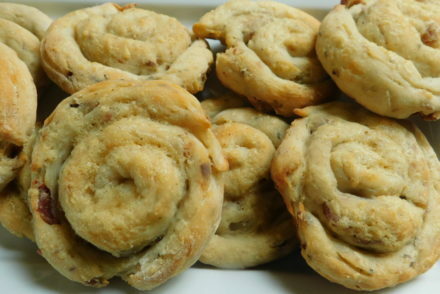 Preheat oven to 400F, wash potatoes and then bake in the oven for about 1 hour or until soft. Let potatoes cool for 15-20 min. 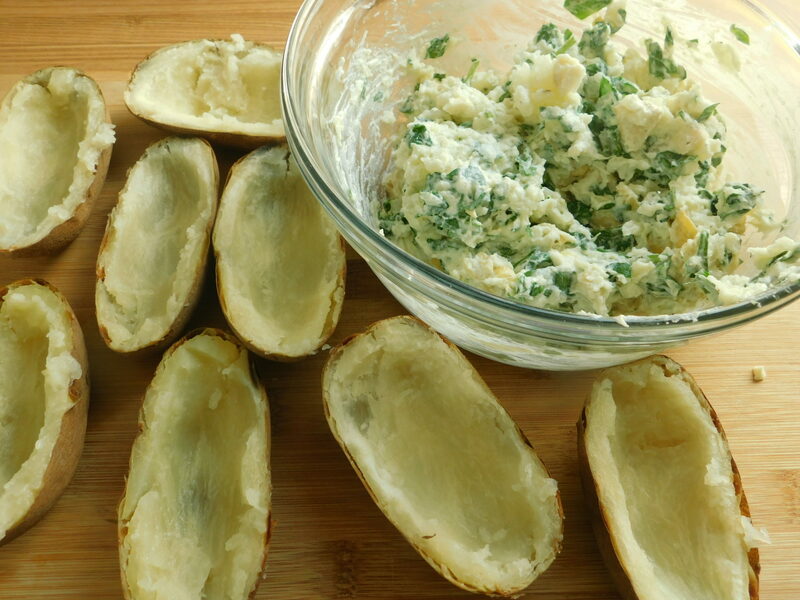 Cut potatoes in half and then scoop out the inside leaving a little left on potato, you will be using the potato you scoop out so set aside. 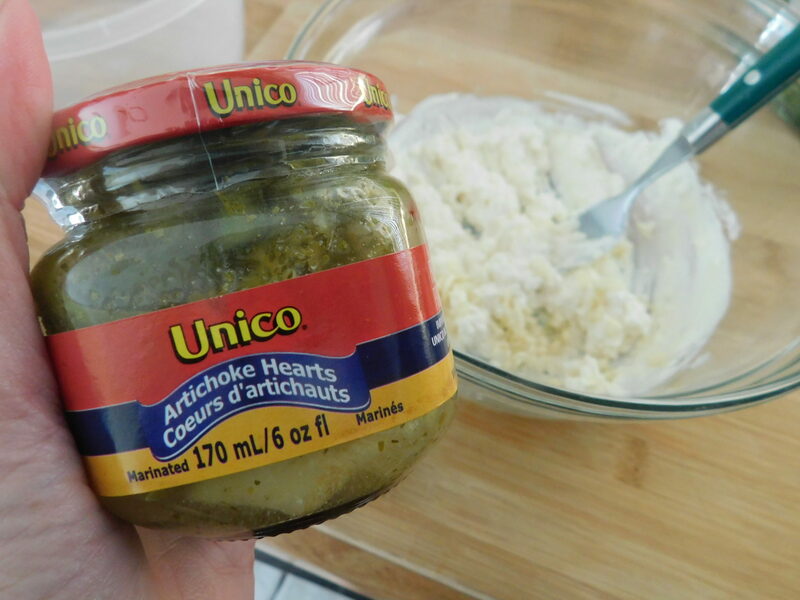 To make your stuffing, mix together the softened cream cheese, yogurt, mayo, parmesan cheese and diced garlic. Add in your potato that you scooped out and stir well. 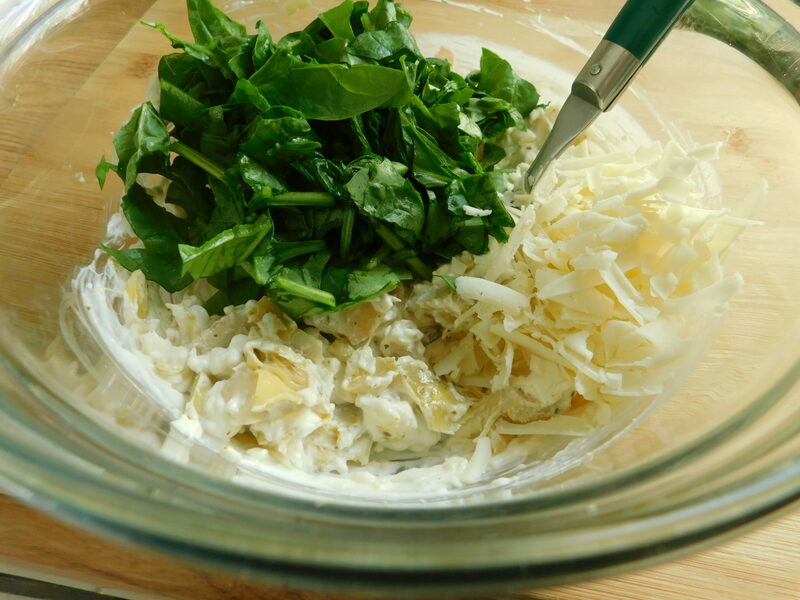 Mix in chopped spinach, chopped artichoke and salt & pepper. 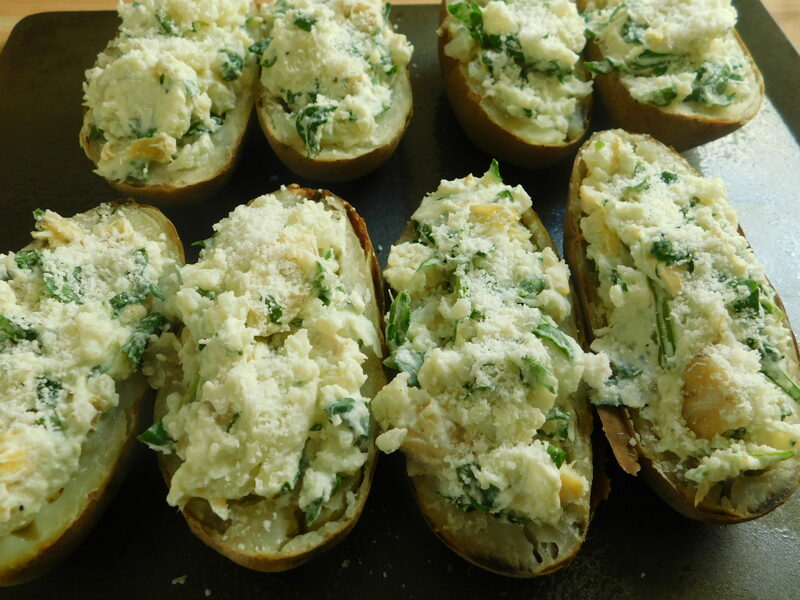 Divide your stuffing mix over your 8 potato shells, sprinkle each with a little of the asiago cheese then return to oven for 20 minutes. 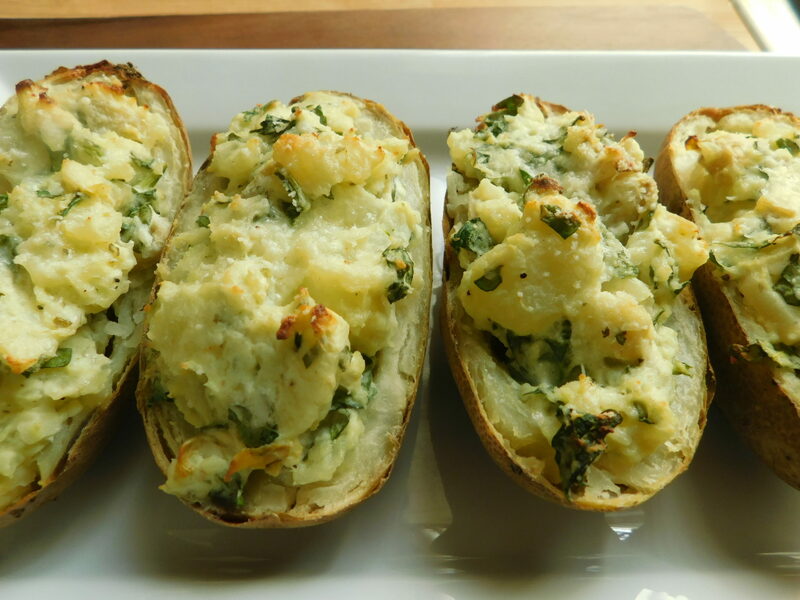 Makes 8 stuffed potatoes, serve warm, store leftovers in the fridge. 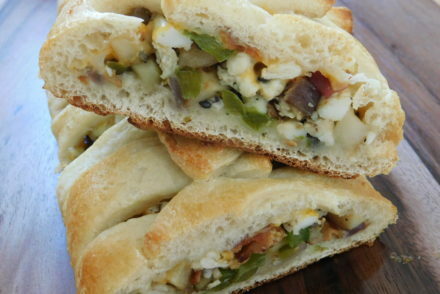 Looks delicious and will make tonight. Thanks again for keeping SP and PP values on your recipes. Not everyone is loving the Freestule program. I’m one of those who didn’t love Freestyle…after 3 weeks in a row of following the program but having small gains, I started counting calories on the app called Lose It and I’ve lost consistently ever since! Thank you for putting the calorie count on everything! It really helps put everything in perspective! 🙂 All of your recipes are delicious and they’re also very low calorie! My husband and my picky teenagers also love them! 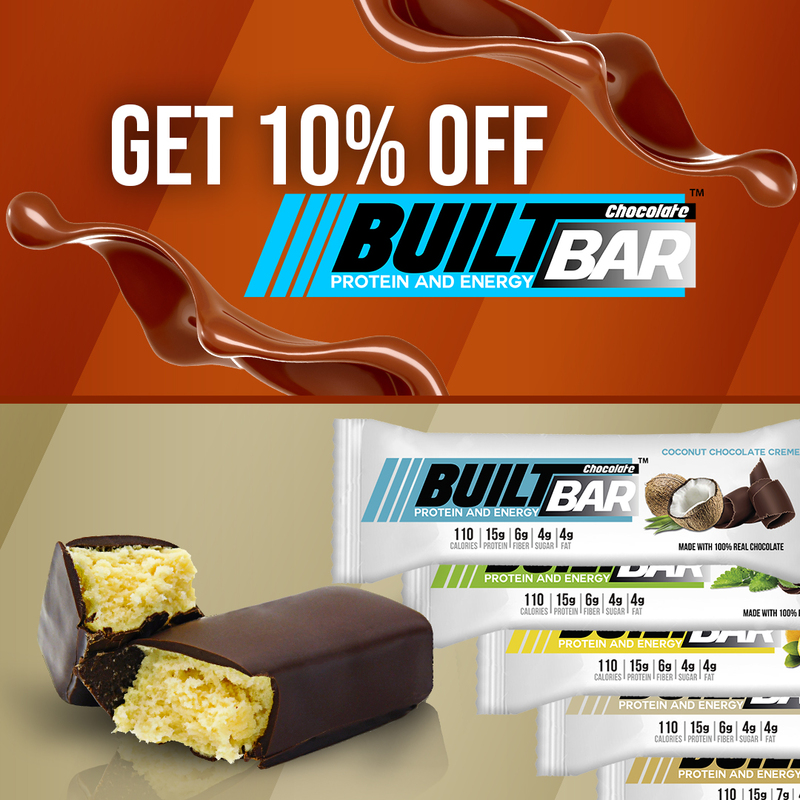 You are my “go to” for new recipes! Thank you!! 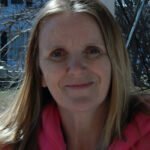 Hi Marcie, thank you so much for your kind words, I am so glad you are all enjoying the recipes 🙂 freestyle is not for everyone (me included) but I know for myself, going into a WW location and weighing in and having it recorded in my little book gives me the motivation I need to have a good week, as far as points go I’m just not going to stress when I go over (probably everyday lol) because I simply don’t eat many of the zero foods and 23 points is not enough for me to survive on .. but I’ll find a balance, I am happy to hear things are working out for you.. good luck on your continued journey! I love this girl recipes !!! Wish I could contact her to tell her. 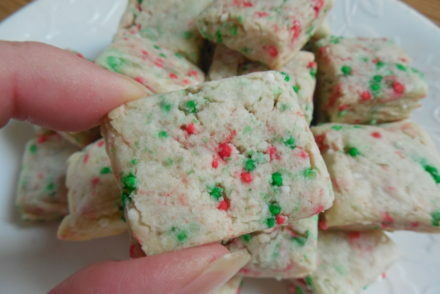 Can these be made ahead. Thanks. This looks great! Just to add- you can always put the potatoes in the microwave and cook them that way if folks are short on time. Thank you!